Integrate ordering content from the world’s leading content marketplace directly into your systems and applications. With the free programming interface from Textbroker, you can automate your content product and optimize your workflow. Would you like to order content on a regular basis? Do you have a large number of orders to place? Do you use a database to plan your content? 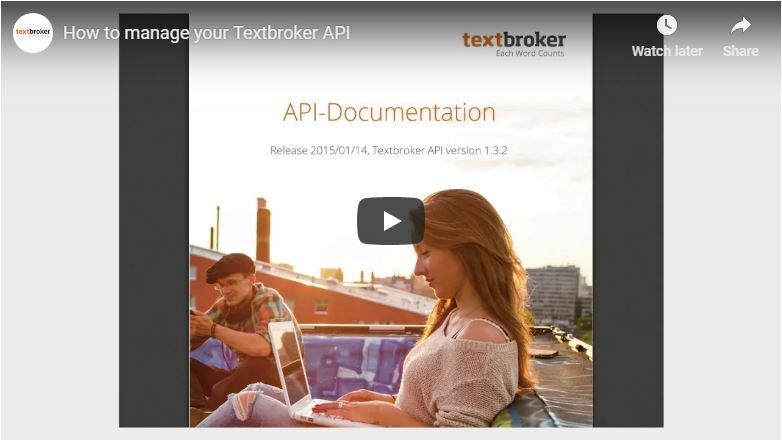 Then take advantage of the benefits of the Textbroker API. Integrate the free Textbroker API into your blog, CMS or CRM, or adapt it to your own application. Once integrated, the Textbroker API will serve as an optimal and SSL secured means of linking your databank to the Textbroker system. In combination with the many export options available on the Textbroker platform, there are also a number of ways to fully automate your content production. Download the API documentation here. Automate the entire ordering process, from placing the orders to accepting them. Seamlessly integrate the ordering process into your system: Logging into the Textbroker platform is no longer necessary. Transfer your data safely and reliably thanks to SSL encryption. Manage all of your content projects at once. Create as many sub-accounts as you need, create individual budgets for each and manage Textbroker credit for the entire team. Check the status of orders as well as your account balance. Use your existing database for content production. Use your preferred programming language with the help of the cross-platform network protocol “SOAP”.